Another successful season has come to an end. Thank you to everyone who participated in the great game of curling this winter. Save the date for our Semi Annual General Meeting! 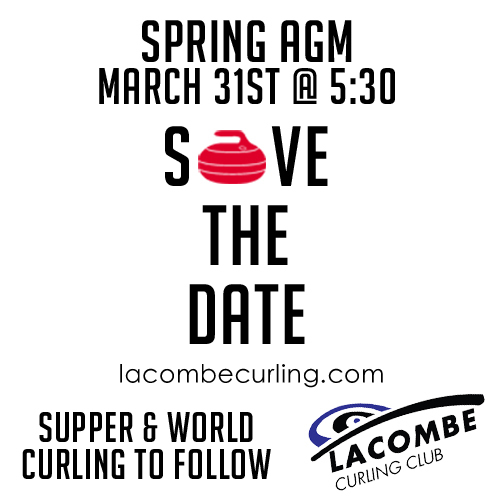 The Lacombe Curling Club is a great place to get together with your co-workers, neighbours or friends! We have six sheets of curling ice and a licensed lounge capable of seating up to 200 people. Ice rentals are available during the curling season and lounge rentals are available all year-round. We offer a wide variety of curling leagues and many excellent bonspiels throughout the season. We are located at 5210 54 avenue in beautiful downtown Lacombe, Alberta...come check us out!